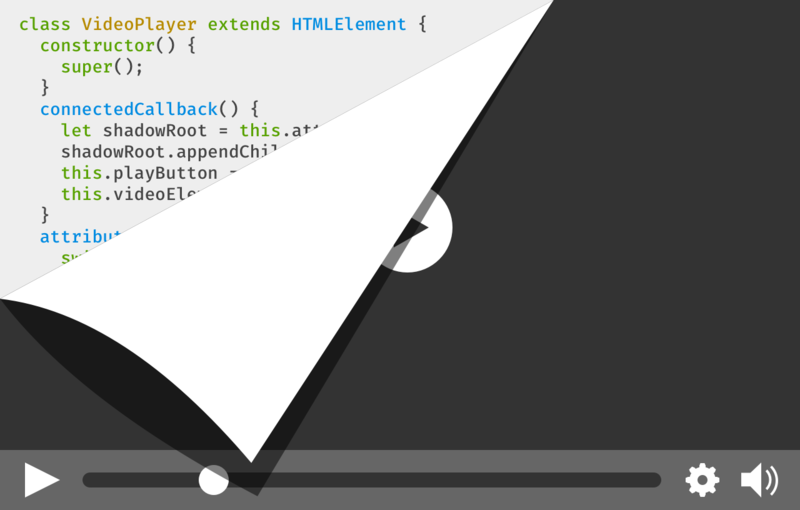 Ever since the first animated DHTML cursor trails and “Site of the Week” badges graced the web, re-usable code has been a temptation for web developers. And ever since those heady days, integrating third-party UI into your site has been, well, a semi-brittle headache. In response, a handful of web standards were drafted. Each standard has some independent utility, but when used together, they enable something that was previously impossible to do natively, and tremendously difficult to fake: the capability to create user-defined HTML elements that can go in all the same places as traditional HTML. These elements can even hide their inner complexity from the site where they are used, much like a rich form control or video player. As a group, the standards are known as Web Components. In the year 2018 it’s easy to think of Web Components as old news. Indeed, early versions of the standards have been around in one form or another in Chrome since 2014, and polyfills have been clumsily filling the gaps in other browsers. After some quality time in the standards committees, the Web Components standards were refined from their early form, now called version 0, to a more mature version 1 that is seeing implementation across all the major browsers. Firefox 63 added support for two of the tent pole standards, Custom Elements and Shadow DOM, so I figured it’s time to take a closer look at how you can play HTML inventor! Given that Web Components have been around for a while, there are lots of other resources available. This article is meant as a primer, introducing a range of new capabilities and resources. If you’d like to go deeper (and you definitely should), you’d do well to read more about Web Components on MDN Web Docs and the Google Developers site. Defining your own working HTML elements requires new powers the browser didn’t previously give developers. I’ll be calling out these previously-impossible bits in each section, as well as what other newer web technologies they draw upon. This first element isn’t quite as new as the others, as the need it addresses predates the Web Components effort. Sometimes you just need to store some HTML. Maybe it’s some markup you’ll need to duplicate multiple times, maybe it’s some UI you don’t need to create quite yet. The <template> element takes HTML and parses it without adding the parsed DOM to the current document. Where does that parsed HTML go, if not to the document? It’s added to a “document fragment”, which is best understood as a thin wrapper that contains a portion of an HTML document. Document fragments dissolve when appended to other DOM, so they’re useful for holding a bunch of elements you want later, in a container you don’t need to keep. The cloneNode method does what it sounds like, and it takes an argument specifying whether to copy just the node itself or include all its children. The template tag is ideal for any situation where you need to repeat an HTML structure. It particularly comes in handy when defining the inner structure of a component, and thus <template> is inducted into the Web Components club. An element that holds HTML but doesn’t add it to the current document. Well, what if we were to try this? Until recently that would have been an error. Browsers didn’t allow the built-in HTMLElement class or its subclasses to be extended. Custom Elements unlocks this restriction. Now every <my-element> on the page is associated with a new instance of MyElement. The constructor for MyElement will be run whenever the browser parses a <my-element> tag. What’s with that dash in the tag name? Well, the standards bodies want the freedom to create new HTML tags in the future, and that means that developers can’t just go creating an <h7> or <vr> tag. To avoid future conflicts, all custom elements must contain a dash, and standards bodies promise to never make a new HTML tag containing a dash. Collision avoided! connectedCallback is called when an element is appended to a document. This can happen more than once, e.g. if the element is moved or removed and re-added. disconnectedCallback is the counterpart to connectedCallback. attributeChangeCallback fires when attributes from a whitelist are modified on the element. It may seem a bit clunky at first, but assistive technologies and other scripts wouldn’t know our custom element is a kind of button without this special markup. From here, all the classic web widget techniques apply. We can set up a bunch of event handlers, add custom styling, and even stamp out an inner structure using <template>. People can use your custom element alongside their own code, via HTML templating, DOM calls, or even new-fangled frameworks, several of which support custom tag names in their virtual DOM implementations. Because the interface is the standard DOM interface, Custom Elements allows for truly portable widgets. Special lifecycle callbacks for detecting element creation, insertion to the DOM, attribute changes, and more. We’ve made our friendly custom element, we’ve even thrown on some snazzy styling. We want to use it on all our sites, and share the code with others so they can use it on theirs. How do we prevent the nightmare of conflicts when our customized <button> element runs face-first into the CSS of other sites? Shadow DOM provides a solution. // attachShadow creates a shadow root. // shadow root supports the normal appendChild method. In the above example, the <div> “contains” the <b> and the <b> is rendered to the page, but the traditional DOM methods can’t see it. Not only that, but the styles of the containing page can’t see it either. This means that styles outside of a shadow root can’t get in, and styles inside the shadow root don’t leak out. This boundary is not meant to be a security feature, as another script on the page could detect the shadow root’s creation, and if you have a reference to a shadow root, you can query it directly for its contents. Whew, we could really use a <template> right about now! Either way, the <b> will be affected by the stylesheet in the root, but any outer styles matching a <b> tag will not. This ability to composite shadow roots with non-shadow content allows you to make rich custom elements with complex inner structures that look simple to the outer environment. Slots are more powerful than I’ve shown here, with multiple slots and named slots and special CSS pseudo-classes to target slotted content. You’ll have to read more! Let’s make a fancy button! We’ll be creative and call the element <fancy-button>. What makes it fancy? It will have a custom style, and it will also allow us to supply an icon and make that look snazzy as well. We’d like our button’s styles to stay fancy no matter what site you use them on, so we’re going to encapsulate the styles in a shadow root. You can see the completed custom element in the interactive example below. Be sure to take a look at both the JS definition of the custom element and the HTML <template> for the style and structure of the element. The standards that make up Web Components are built on the philosophy that by providing multiple low-level capabilities, people will combine them in ways that nobody expected at the time the specs were written. Custom Elements have already been used to make it easier to build VR content on the web, spawned multiple UI toolkits, and much more. Despite the long standardization process, the emerging promise of Web Components puts more power in the hand of creators. Now that the technology is available in browsers, the future of Web Components is in your hands. What will you build? Good catch! Will fix the quote situation. Web Components were a lot easier to work with than I expected. Very nice! This is a clear and brilliant presentation on WebComponents, a very longly awaited technology in Firefox. I wrote this paper (in french, sorry) about how i used it to redefine the audio tag interface https://dascritch.net/post/2018/11/06/Reconstruire-son-lecteur-audio-pour-le-web . The first part of the paper is an history of sound inclusion in webpages and may not be very interesting for everyone. Is there any way to style things that are inside the shadow DOM from outside? Either with explicit support from the custom element (assuming we have a custom element) or without?